A great deal of misinformation is present in popular culture regarding the effects of creatine supplementation on health and sports performance. For instance, it is not uncommon for various media outlets to claim, in spite of the lack of supporting evidence, that 'supplementing with creatine is harmful to the liver and kidneys and may cause dehydration and cramping.' In reality, creatine is intimately involved in energy metabolism, performance, and training adaptations, and, recently, several studies have uncovered its potential clinical application toward treating various neuromuscular diseases and maintaining brain function. 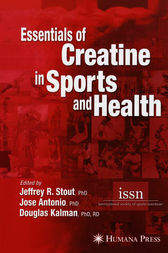 This book unifies the sum of information on how creatine affects body composition, exercise performance, and health. Because the body of data on creatine is ample and constantly growing, a book such as this is a timely and important resource for the clinician, the coach, and the sports scientist.